Most forage managers learn to identify the plants of their area by the gradual process of working the land. The process is comfortable but long and sometimes costly. Knowing which plants are useful or detrimental to livestock can be very beneficial. Identification of all forage species is impossible but learning the most common can be achieved with time, strategy, and effort. 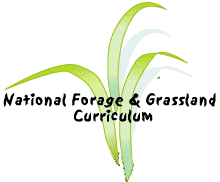 Learning the differences between the two main groups of forage plants (grasses and legumes) is a basic foundation. Distinctions among forage plants are clearly seen when the vocabulary needed for identification is mastered. Grasses can be identified by their collar regions at almost any stage and by inflorescences during the reproductive stage. Legumes can be grouped by leaves during most stages and inflorescences during the reproductive stage. Consistent practice is needed to acquire identification skills quickly but the acquired skills will prevent costly mistakes. Forage managers, veterinarians, conservationists, wildlife managers, and environmentalists will all benefit from better identification skills.